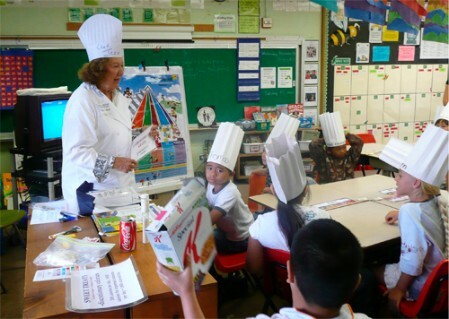 The ACF Chef and Child programs focus on the importance of the food groups in the USDA.gov as they contribute to a nutritious diet aimed at achieving good health and proper growth for children. 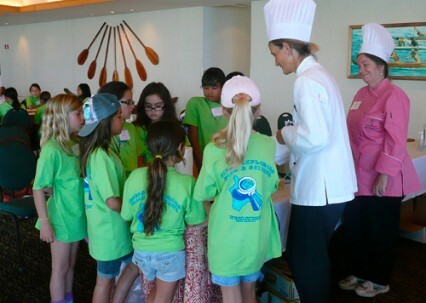 Over the past 14 years, Jean Hull has developed and delivered nutrition awareness programs with chapter member support to over 2000 children each year in Kona and Kohala. Her team includes her Co-chair: Tami McAller and Simone White. 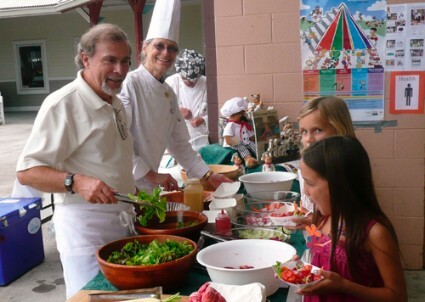 The Chef and Child team's major activity is to reach every second grade class in Kona which includes a little cooking activity for the children at their desks. After a nutrition video, a follow-up interactive dialogue is held with the students. Then the students prepare a smart sandwich at their desk. In addition to reaching the second grade classes, the CCF team goes to the Waimea Keiki Fest and do a Salad Tasting Station. Reaching hundreds of kids and some parents we help children learn to enjoy garden greens and fresh vegetables. For the GEMS Girls Exploring Math and Science are CCF team serves a healthy breakfast to 250 girls and Jean and Simone White do three workshops throughout the day: the workshops are entitled: FOOD AS SCIENCE, MATH, AND NUTRITION. Go to ACFChefs.org and click on Chef and Child Foundation to learn more about this amazing organization dedicated to helping our children achieve lifetime good health across the nation. The CCF mission statement is “To educate children and families in understanding proper nutrition through community-based initiatives led by American Culinary Federation chef members, and to be the voice of the culinary industry in its fight against childhood hunger, malnutrition and obesity.” The Chef and Child Foundation has been developing programs to stimulate grassroots efforts to be led by chefs in the communities across America. followed by assembling a fabulous fruit kabob which they dip in yogurt.